Fish and chips may seem like a rather simple meal but the classic British dish is nothing of the sorts. What fish, what kind of potato, what condiments and that's before you realize that most of the fish and chips shops in the UK also sell pies. You may enjoy mushy peas, beans, gravy and lots of people opt for curry sauce. Then there's bread, barn cake, bap or roll? The options are endless and that's without going into the pros and cons of battering a Mars Bar. The whole deal can get a little confusing - which is why this infographic from Visually is so useful. 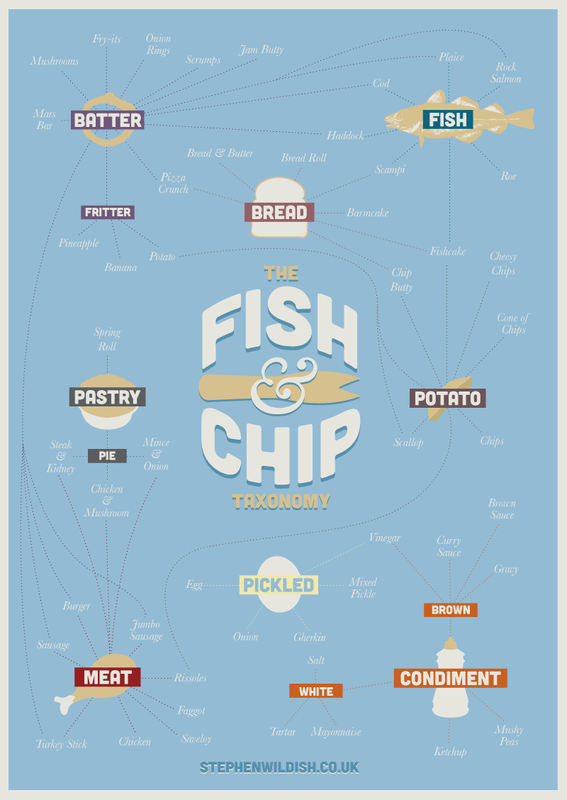 It breaks down fish and chips into every minute detail that can be considered when ordering - a top look at the Taxanomy of Fish and Chips.